Wellington X3467 squadron ID VR-N left Mildenhall for an operation on Hamburg. On board was a second pilot, attached to the crew as part of his training. From this 2nd. Pilot's (F/S MacWilliams) MI9 interogation report completed on his return from internment comes some indication of what the crew were facing prior to lose of the aircraft. The F/S reported seeing tracer rounds and heavy flak as the Wellington came over the coast near Welhelmshaven. This was also verified by Sgt. Parker the nose gunner But there was no immediate indication of any hits or damage from this enemy action. It was not for a half hour or more later before the port engine caught fire. The pilot using the engine extinguisher managed to put out the fire. Now running on the remaining engine the bombs were let go and P/O Howard disposed of the ammunition via the flare chute. With the lightened load they managed to climb another 10,000 feet with the aide of the restarted port engine. It was now that the starboard engine burst into flames and it too was extinguished then feathered. Again bringing the Wellington down to just one engine. Fate dealt them another bad hand as the port engine then again caught fire and the fire extinguisher fluid had been used up. The pilot then tried to restart the starboard engine but was unsucessful and it now also burst into flames. The aircraft was abandoned by the crew using the forward escape hatch, all except P/O Howard who had been at the flare chutes and tried to leave by the rear hatch. No one of course knows what exactly happened to P/O Howard and why he did not manage to escape the aircraft where his body was later recovered. Sgt. Parker was noted as saying there was an explosion in one of the fuel tanks after he had left the aircraft. In some way Howard was caught inside the aircraft, unable to safe himself. The other crew members became POWs. The aircraft crashed some time after 0130 April 9th between Roggenburg and Barssel near Lear. Most of the captured crewmen were sent to Stalag VIIIB later renamed 344, which is the number shown in their offical records. F/S Hubert Brooks (later Wing Commander Brooks). 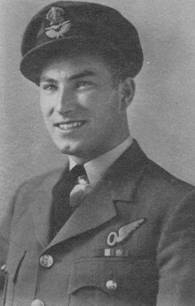 Became 419 Squadron's first escaper and evaded the German forces during his years with the Polish Underground.